Tag line: "The darkest Nazi secret... is about to be revealed!" 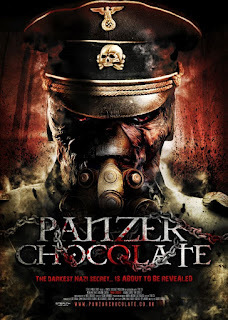 2013’s Panzer Chocolate has been billed as the 1st interactive & transmedia horror film. A brief intro at the start of the movie tells of how you can download an App that, when synced with the film, will enhance the experience of watching it, offering extra scenes and additional background on its characters and story. The trailer for Panzer Chocolate further informs us that, in addition to the App, there’s a video game as well as a comic book that delve even deeper into this intriguing world of Nazi hideaways and stolen treasure. But I didn’t bother with any of that crap. I wanted to watch a movie, and was sure that Panzer Chocolate the motion picture, despite all that extra mumbo-jumbo, would stand on its own. That makes sense, right? Hoping to prove her theory that Spanish artwork stolen by the Nazis during World War II is still being held in a secret underground bunker (which the Nazis called “Valhalla”), Madrid-area college student Julie Levinson (Melina Matthews) seeks out a book written by a Professor named Von Juntz (Josep Segui), which offers insight into Nazi history and practices while also predicting that a “Fourth Reich” is on its way. With the help of volunteer librarian Joe Brown (Tony Corvilla), Julie locates the book in a secluded section of the University’s library, and even though an interview with the Professor himself proves fruitless (he talks of nothing but German chocolate, which was dispensed to the troops guarding the bunker), his book provides the clues needed to locate the elusive Valhalla. Joined by Joe as well as her roommate Rask (Ariadna Cabrol) and boyfriend / reporter Micky Allen (Mark Schardan), Julie follows the map and, in the middle of nowhere in the Pyrenees mountain range, finds what she’s been looking for. But in doing so, the group also awakens the Guardian of Valhalla: a gargantuan humanoid in a Nazi uniform whose only purpose is to kill all trespassers. Will Julie uncover the secrets of Valhalla, or fall victim to a psychotic killer? At the outset, Panzer Chocolate is a fascinating motion picture, with a number of mysteries that, when pieced together, lead its characters directly to the hidden bunker. There’s excitement in the air as Julie and the others try to solve these various puzzles, and I was caught up in it. Later on, when the guardian shows up and starts chasing everybody, Panzer Chocolate switches things up a bit, becoming a standard slasher flick with a few creepy moments. Even these scenes have their charms (one kill is particularly gory), but, unfortunately, the big reveal at the end is a major letdown. With all its early talk of history, cartography, buried treasure and the Fourth Reich, Panzer Chocolate gave me the impression it was going to be a thinking person’s horror film. Once we learn what’s actually going on, this “intelligent, thought-provoking” picture falls apart at the seams. And the less said about the final scene, the better (to be fair, the App supposedly contains the “real” ending, and while I haven’t watched it yet, it couldn’t possibly be any worse than what is in the movie). Both Melina Matthews and Ariadna Cabrol do a fantastic job as the leading ladies, and as I said, the film’s first two-thirds are something special. But if I ever decide to watch Panzer Chocolate again, I think I’ll buy the App, because the movie’s finale definitely needs a little help.